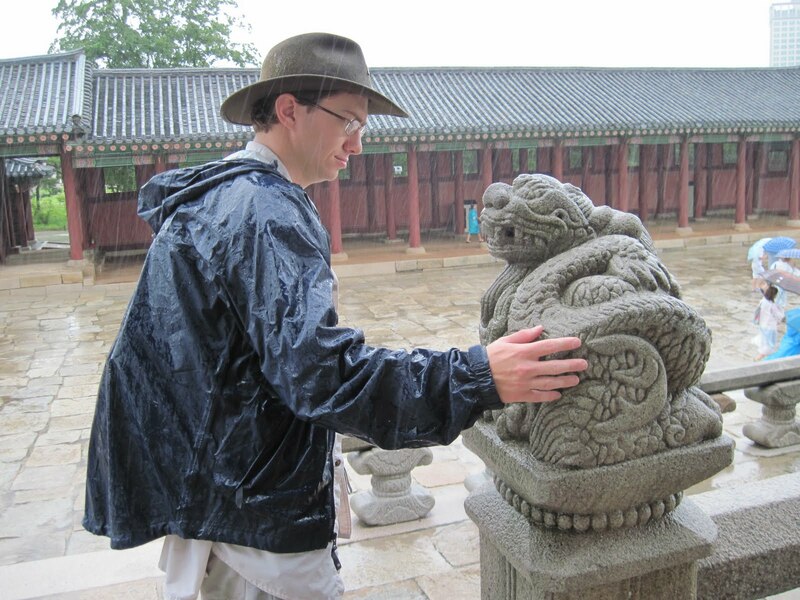 Scott and I trekked in to Seoul on Saturday and visited Gyeonbok Palace. 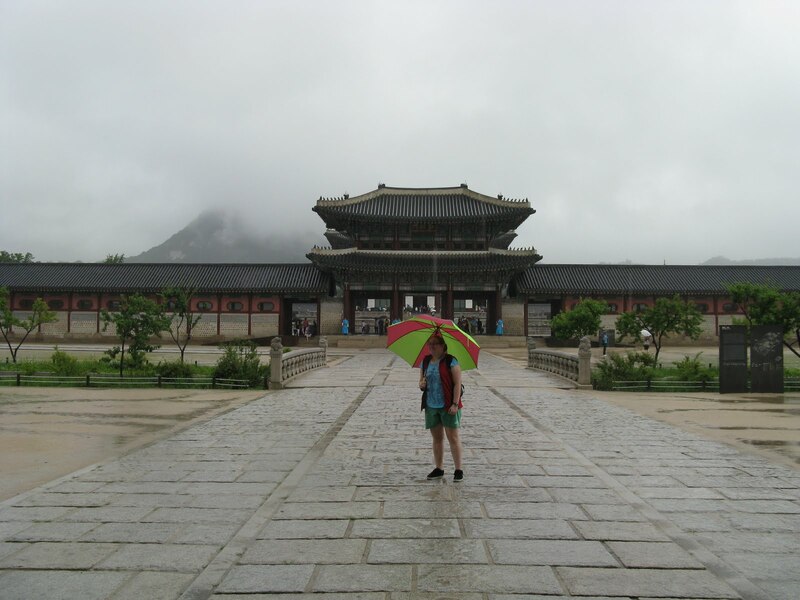 The palace was founded in the 14th century, during the Joseon Dyanasty. 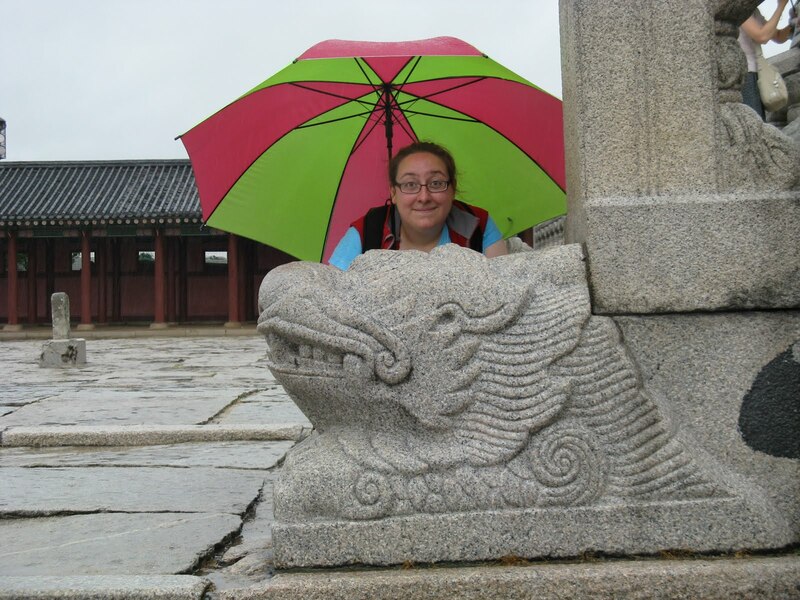 It was a monsoon day in Korea but that meant the crowds were pretty thin and we had a great day. 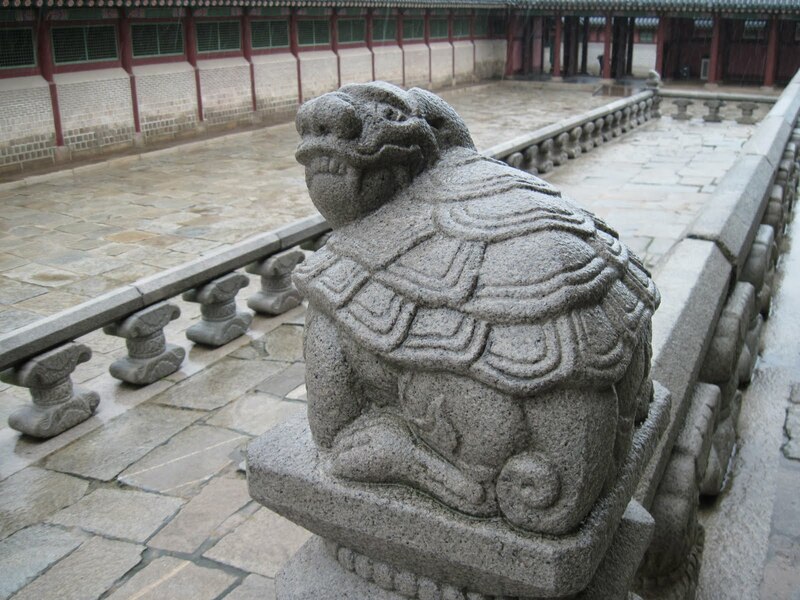 There are 36 stone figures around the main hall, Geungjeong-jeon. One of my favourites was this turtle monster, called a dusky warrior turtle. Perhaps an inspiration for Gamera? There were many excellent statues around the grounds. Scott says hello to a new friend. 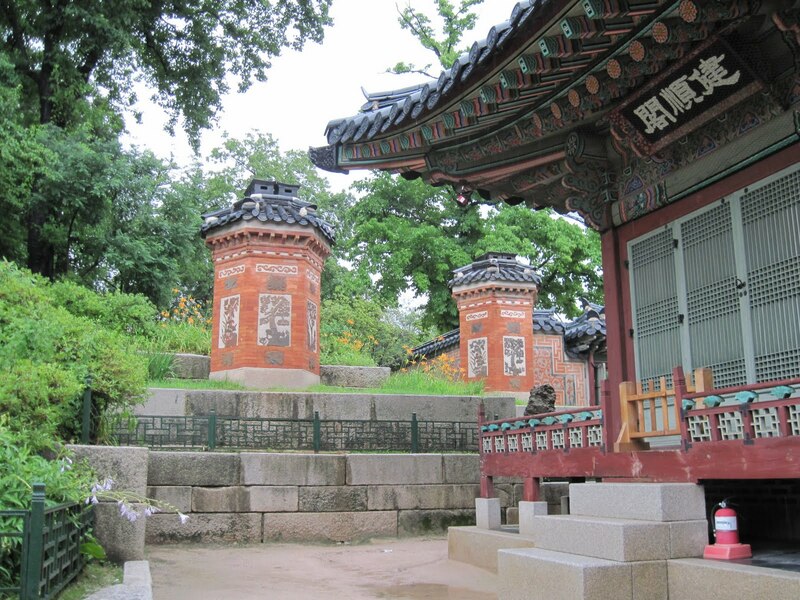 This is the garden behind Gyotae-jeon, the Queen’s residence. The chimneys have various symbolic animals on them. We learned that cranes and turtles represent longevity, butterflies and flowers represent fertility, and, somewhat surprisingly, bats represent wealth. 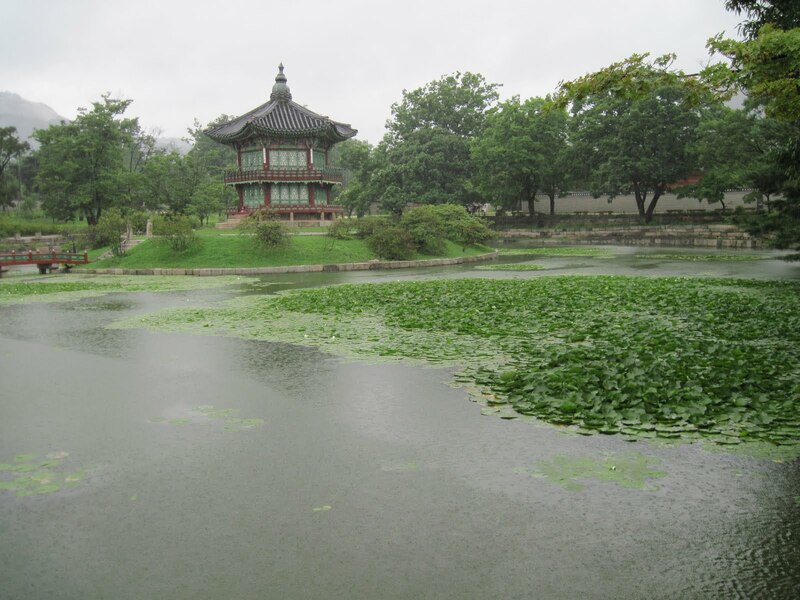 This is Hyangwon-jeong, a garden for relaxation. We saw two ducklings slowly making their way across the tops of the lily pads here. Very cool! I like the dusky warrior turtle! The dusky warrior turtle is great. The whole place looks very interesting. Bats mean wealth, so do “batty people” have lots of wealth? Why is it always so that the butterflies and flowers are related to fertility or explanations of fertility? And I thought that was limited to north american parents explanations….go figure.